Featuring a whole selection of pictures of the Hawks and their friends, allies, and adversaries! 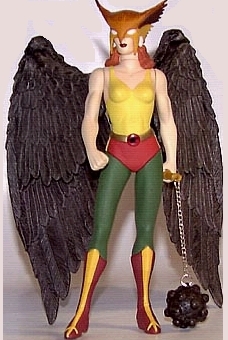 Plus, pictures of toy action figures that have been designed over the years. So here we have Carter Hall finding a Ninth Metal knife that's one of the keys to reganing his memories as having been Khufu in his previous lives! And that's just the beginning. 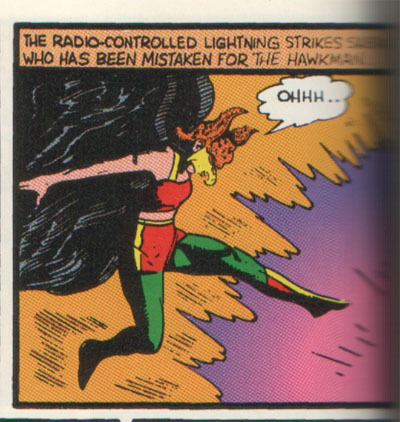 Hawkgirl faces a storm of lightning in the first picture. And in the other, Sheira Sanders makes sure to arm herself even in her daytime guise. 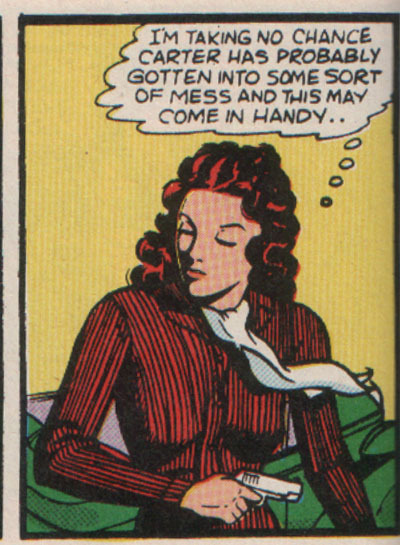 Of course, as you're probably guessing, no, even she doesn't usually use guns for weapons. 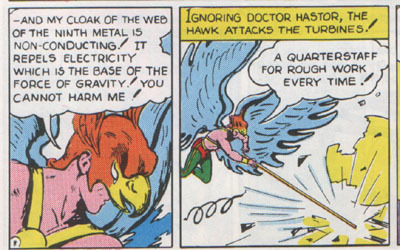 Quarterstaff fighting is another skill that Hawkman excels in! 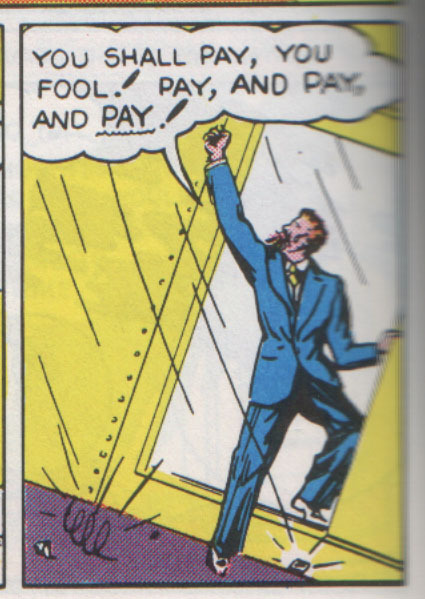 And is quite useful for foiling one of Hath-Set's evil schemes during the Golden Age. 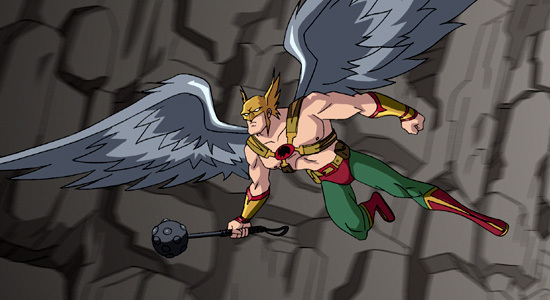 And the picture next to it comes from one of the animated productions based on DC creations. 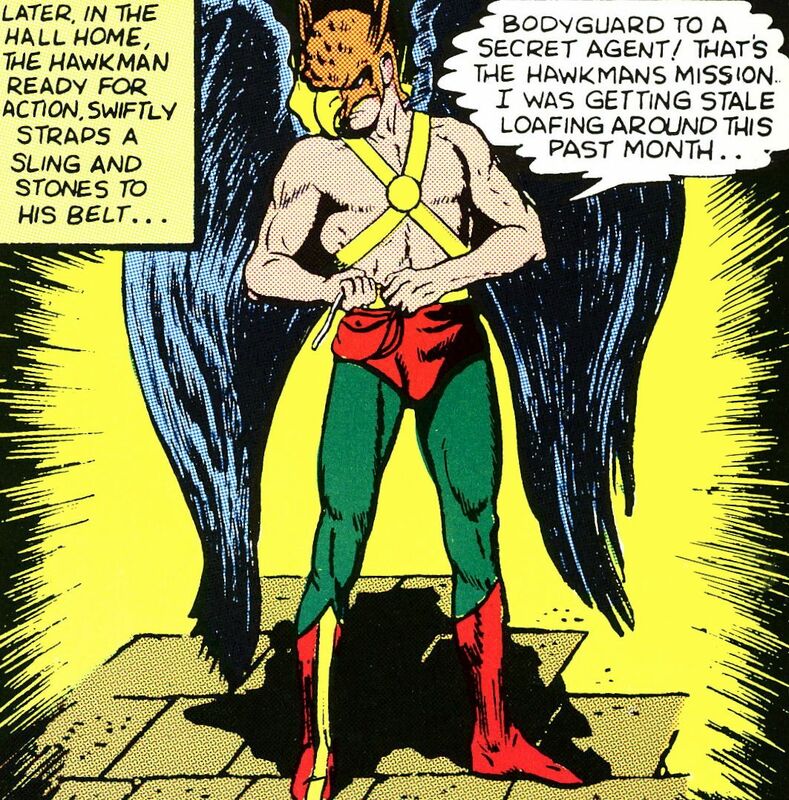 Golden Age Hawkman had a pouch on his belt, very similar to Batman's utility belts. 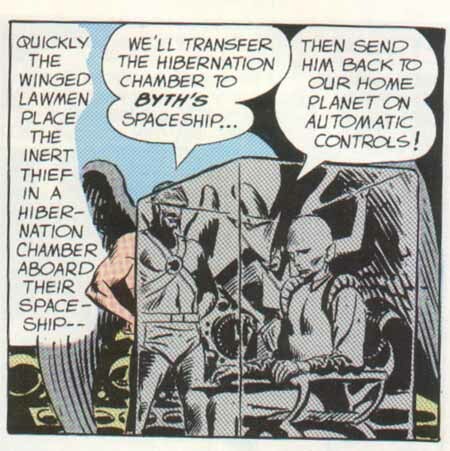 Though incapacitated, that's the Thanagarian villain named Byth in that odd-looking cube there. And now, he's being sent back to where he came from! Next to that is one of the first appearances of Infinity Inc's cast members, including Carter Hall's son Hector in his Silver Scarab guise. 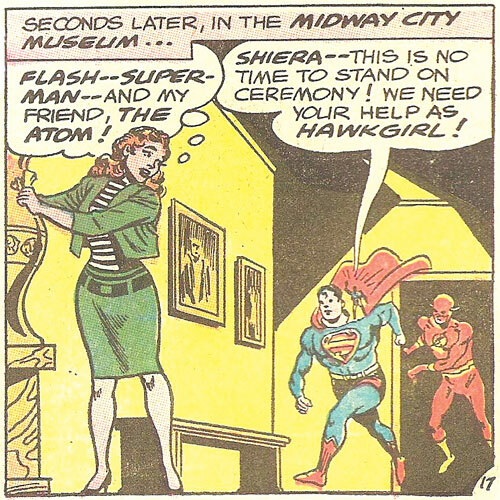 Here's Superman, Atom and Flash charging into the Midway City museum asking Shayera for some backup assistance on one of their cases. 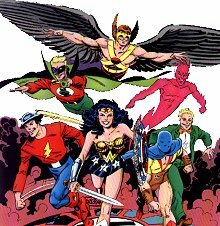 Also, a picture of some of the JSA's original members, possibly as seen in All-Star Squadron. 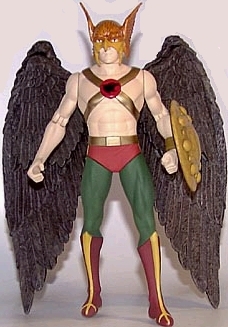 The above are toy action figures, 2 of Hawkman and 2 of Hawkgirl, and two appearing together in one picture. One's armed with a spear, another a shield, and another a spikeball. 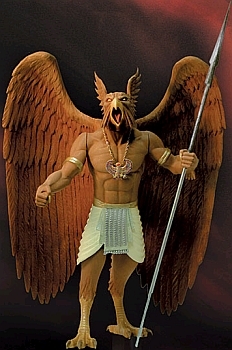 Note that the first one is of Khufu in his original Egyptian form. 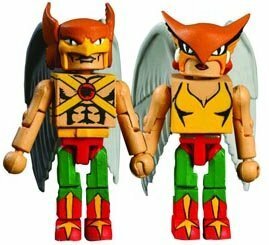 The second one is a pair of DC Mini Mates toys that are reminiscent of Lego's action figure designs. 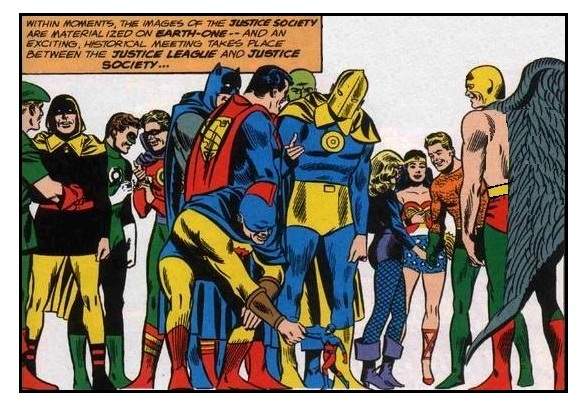 This comes from the famous first meeting of the Justice League with Justice Society from Earth-1 and Earth-2. 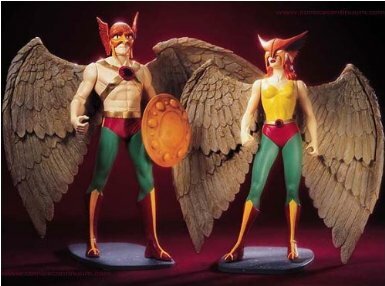 Two action figures, Hawkman and Hawkgirl together, in the picture on one side. And a Bronze Age picture of Carter with a gold helmet in the other. 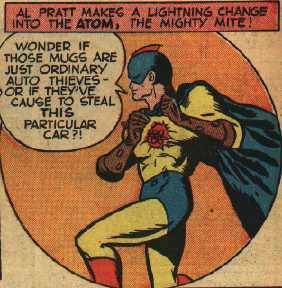 The Golden Age Atom Al Pratt appeared in Flash Comics as one of the features besides Hawkman and Golden Age Flash Jay Garrick. 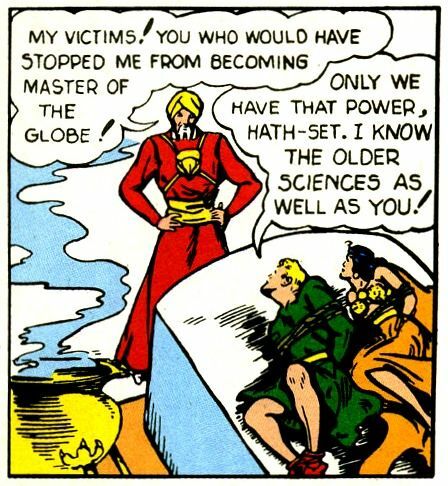 And of course, he was a member of the JSA at the time. 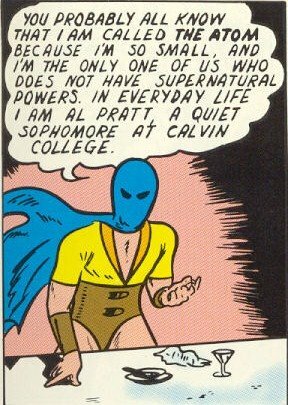 He later changed his costume design to one whose cowl bore a fin atop the head. This panel shows where, in ancient times, Hath-Set captured the noble royal figures and put them to death. As we long know, Khufu and Chay-Ara would not be defeated forever. 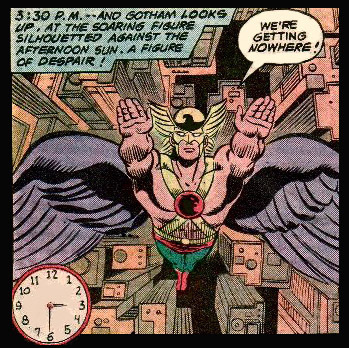 In modern times, in his reincarnation as the criminal Anton Hastor, Hath-Set swears vengeance upon Hawkman and Hawkgirl...and like all other criminals of his sort, makes an utter fool of himself. 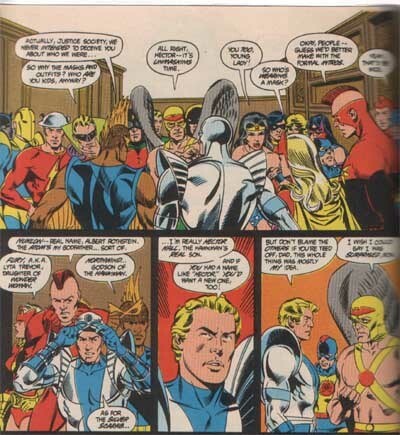 This picture is from an occasion where Ray Palmer let the Hawks know he was the Atom. And, since it was only fair they return the favor, they took off their masks to let him know who they were too. 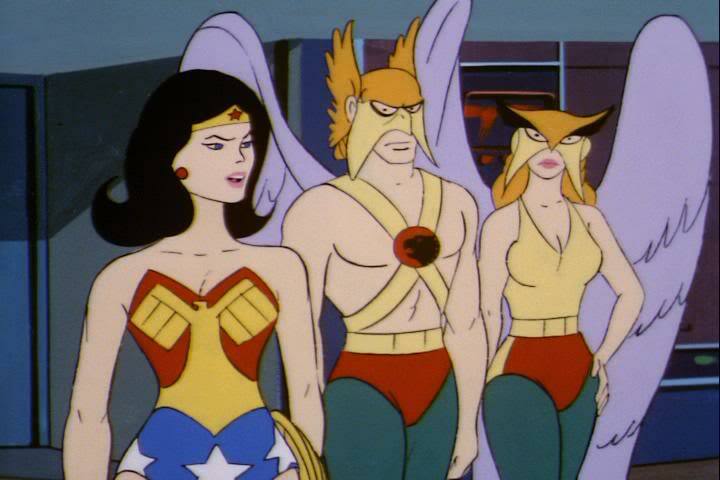 The other picture comes from the Super Friends cartoon that aired around 1973-86, and shows the Hawks alongside Wonder Woman. 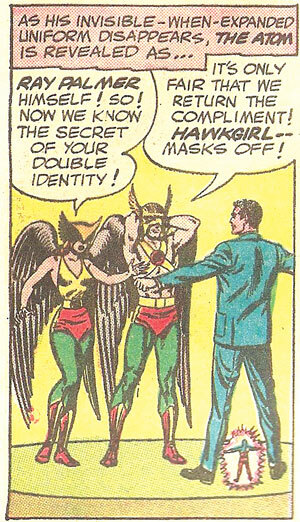 In All-Star Squadron #11, Sheira works on the perfect mask that emphasizes her femininity. 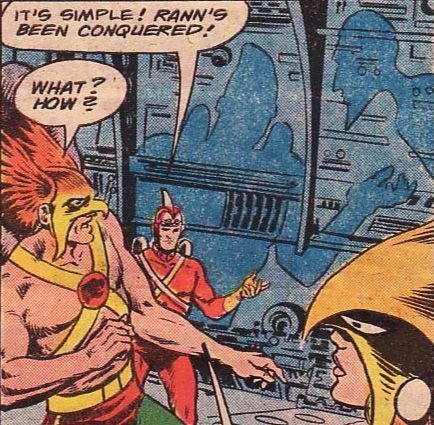 And during the Bronze Age, the Thanagarian Hawks come to the rescue of planet Rann, which was located fairly close to their own planet in the same galaxy.